The Sub-Antarctic Biocultural Conservation Program editorial line seeks to enhance the dynamic relationship between a network of collaborators. A creative methodological approach for students is developed as they work to translate texts. There is the creation of an interregional dialogue between the Northern and Southern hemispheres. The integrated relationship of biological and cultural aspects of environments is made explicit in discourse and discussion. The books are interdisciplinary texts useful for students and researchers, but also for readers unfamiliar with the region and the research. Each book invites the reader to enhance their biological and cultural knowledge, but also excites their imaginations with vivid images and beautiful stories. The Multi-Ethnic Bird Guide, published in 2010, describes the sub-Antarctic magellanic bird species' ecological and cultural contexts. It describes their physical appearances, typical habitats, and conservation status, but also describes the cultural relationships of the birds to the human inhabitants of the region. The Yahgan, Mapuche, Spanish, English, and scientific names are provided for each bird, and cultural stories about each bird are shared. The book comes with CDs to provide an audio experience of the bird calls and recitation of traditional stories about the birds. This is available in either Spanish or English. Miniature Forests of Cape Horn, published in 2012, investigates a way to approach the bryophytes and lichens of the sub-Antarctic region. Cape Horn is a hot spot for bryophyte diversity; 5% of the world's bryophytes are found in less than 0.01% of the planet's terrestrial surface. Ecotourism with a hand lens teaches visitors to rest in the forest and pause to investigate the aesthetic, ethical, and biocultural elements of the miniature world within the larger forest. The text provides information on the biology of lichens and mosses of the sub-Antarctic forests, accompanied by a multitude of high-definition photographs of the bryophytes. This book is bilingual with both Spanish and English. Ecotourism with a Hand Lens assembles a series of artistic renderings to understand the Miniature Forests of Cape Horn. The readers investigate the miniature forests through four conceptual hand lenses (economic, ethical, aesthetic, and biocultural). The relationship between art and science is illustrated through an in-depth investigation into the natural forms within Cape Horn's lichens and mosses. This is available in either Spanish or English. Sub-Antarctic Magellanic Ornithology compiles the diverse studies from 10 years of ornithological research by the sub-Antarctic Biocultural Conservation Program researchers between 2004 - 2014. The long-term ornithological studies at the Cape Horn Biosphere Reserve is composed of an interdisciplinary team practicing systematic research to gather knowledge of the seasonal variations in diversity and abundance, natural history, and ecology of the magellanic bird species. This book seeks to contribute to the knowledge of the birds and the protection of the habitats we share with them. This is available in either Spanish or English. Ecology and Ethics is a series is devoted to continuing research at the interfaces of ecology and ethics (embedded in the multiple fields of philosophy and ecology) to broaden our conceptual and practical frameworks in this transdisciplinary field. Confronted with global environmental change, the academic community still labors under a tradition of strong disciplinary dissociation that hinders the integration of ecological understanding and ethical values to comprehensively address the complexities of current socio-ecological problems. During the 1990s and 2000s, a transdisciplinary integration of ecology with social disciplines, especially economics, has been institutionalized via interdisciplinary societies, research programs, and mainstream journals. Work at this interface has produced novel techniques and protocols for assessing monetary values of biodiversity and ecosystem services, as illustrated by the Millennium Ecosystem Assessment. 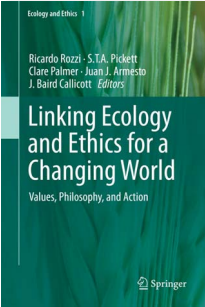 Linking Ecology and Ethics for a Changing World: Values, Philosophy, and Action is a collaborative work published in 2014. The book investigates the possibilities to integrate philosophy and ecology during an era of globalization, climate change, and biocultural diversity loss. Alternative worldviews and concepts of conservation are investigated, environmental philosophy is discussed, and contemporary ecosystem theories are evaluated. The book calls for and contributes to environmental ethics literacy; it begins to bridge the gaps between ecology and ethics through its collaborative efforts. Earth Stewardship implies a paradigm shift that links facts and values, multiple forms of ecological knowledge and practices, and broadens the mission of the ecological sciences. To confront global environmental change it is necessary, but not sufficient, to conduct long-term socio-ecological research. It is also necessary to act. Earth stewardship calls on ecologists to engage not only in the production of knowledge, but also in public discourse, decision making, education, and governance. As a means of engaging science and society in rapidly reducing current rates of anthropogenic damage to the biosphere, the Ecological Society of America (ESA) launched the Earth Stewardship Initiative in 2009. Since then, this call for action has been appealing not only to ecologists, but also to anthropologists, sociologists, engineers, economists, religion scholars, philosophers, conservation biologists, other professionals, decision makers, and citizens interested in environmental, economic, and social sustainability.